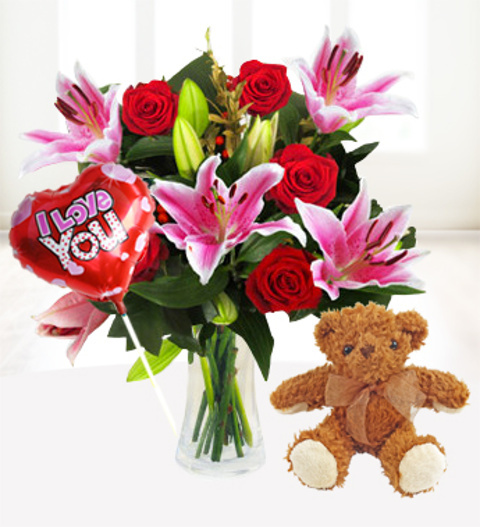 A luxurious bouquet of lush red roses and sweet stargazer lilies set in a bed of forest greens and folded aspidistra. The arrangement is expertly arranged by our talented florists and is perfect for expressing your love this Valentine's Day. Also included is a cute cuddly bear, a FREE box of fine Belgian Chocolates and a lovely heart shaped stick balloon. This gift is sure to impress any recipient and is available for UK next day delivery! Chocolates may contain nuts.